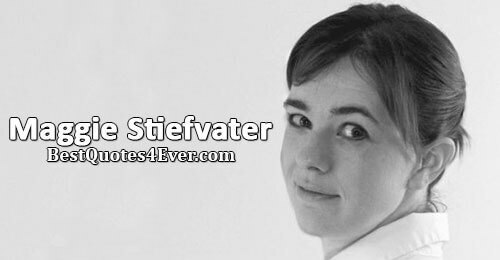 Maggie Stiefvater is a writer, artist, and musician and the New York Times bestselling author of "Shiver", hailed by Publishers Weekly in a starred review as “a lyrical tale,” and by BookPage as “beautifully written, even poetic at times, and a perfect indulgence for readers of all ages. ”There are more than 1.8 million copies of the trilogy in print. 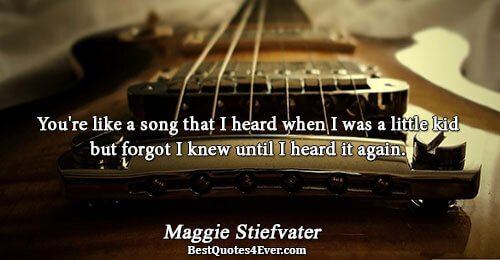 You're like a song that I heard when I was a little kid but forgot I knew until I heard it again. I wanted a library like this... A cave of words that I'd made myself. Ronan Lynch lived with every sort of secret. His eyes were frighteningly alive, the curve of his mouth savage and pleased. It suddenly didn't seem at all surprising that he should be able to pull things from his dreams. Somehow, having a deer preside over the ceremony of a werewolf and a girl seems oddly appropriate. I was thinking lots of things, but most of them needed to stay thoughts, not words. It's easy to convince men to love you, Puck. All you have to do is be a mountain they have to climb or a poem they don't understand. Something that makes them feel strong or clever. It's why they love the ocean. The world needs more love at first sight. I wish you could be kissed, Jane,' he said. 'Because I would beg just one off you. Under all this.' He flailed an arm toward the stars. Right now, it's hard to imagine that it is raining anywhere in the world. And then I opened my eyes and it was just Grace and me - nothing anywhere but Grace and me - she pressing her lips together as though she were keeping my kiss inside her, and me, holding this moment that was as fragile as a bird in my hands. Many, many readers have written asking me wistfully about the nature of Sam and Grace's relationship, and I can assure you, that sort is absolutely real. Mutual, respectful, enduring love is completely attainable as long as you swear you won't settle for less. What are you wishing for?' Grace interrupted. 'To kiss you,' I said to her. In the darkness, he is invisible, but I can still feel him beside me. Sometimes you don't have to see something to know it is there. My chest ached, my body speaking a language my head didn't quite understand. But Grace, the only person in the world I wanted to know me, just ran a wanting finger over the cover of one of the new hardcovers and walked out of the store without ever realising I was there, right within reach. Grace: I picked up my sweater from the floor and crawled back into bed. Shoving my pillow aside, I balled up the sweater to use instead. I fell asleep to the scent of my wolf. Pine needles, cold rain, earthy perfume, coarse bristles on my face. It was almost like he was there. We have to be back in three hours," Ronan said. "I just fed Chainsaw but she'll need it again." "This," Gansey replied "is precisely why I didn't want to have a baby with you.